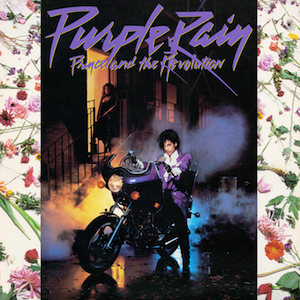 The album cover for "Purple Rain", one of the top albums of the '80s. made millions off it. However, the effect Prince had on the 1980s went far beyond one album, with several hit albums, singles, and movies. By the end of the decade he was even hanging out with the Caped Crusader, Batman, himself. Recently, I heard Prince died and I had this whole mix of emotions. It is never nice to hear someone that young has died. On a musical level, I never really liked Prince when I first heard him, but his music gradually grew on me as he released more and more. And he just kept popping up in odd places. Like no other artist, Prince was an acquired taste. Music did not become a significant part of my life until 1984, part way through Grade 9. I started listening to the radio, then got my first ghetto blaster for Christmas. One of the songs that was on the charts when I first tuned in was, “Let’s Go Crazy” by Prince. It was the second single off his album “Purple Rain”, following the success of, “When Doves Cry”. Both went to number one on the Billboard Hot 100 charts. Eventually, the title track “Purple Rain” would make its way to the radio, followed by “I Would die 4 U”. That last song I also saw on “Solid Gold” one Saturday night when it made the chart there. “Purple Rain” was also a movie, so the album doubled as a sort of sound track. Prince starred in it as a musician, in a semi-autobiographical role, and it would go on to win the Oscar for best original song score. One other note of interest for me was that Clarence Williams III played Prince’s father in “Purple Rain”. I loved Williams when he played Linc Hayes in the “Mod Squad”. To this day, I have not seen “Purple Rain”, although maybe it is time I should. There are few things in the world I detest more than censorship. Speech has to be balanced with good taste, but people do not have a right not to be offended. “Purple Rain” had another single that drew some attention for its controversial lyrics, putting me in the position of defending Prince’s right to say it, not what he actually said. “Darling Nikki” contains the lyrics ”…masturbating with a magazine…” It caught the attention of Tipper Gore, one of the people in this world whose views I detest most. Before she was the Second Lady of the United States (married to former Vice-President Al Gore) she was a crusader for morality in music. "Darling Nikki" was on her list of songs that she eventually wanted banned. Her efforts ultimately led to warning labels on records, which is not necessarily bad, but her efforts at censorship do offend me. So, Prince and I are in common cause over free speech. “Darling Nikki” and “Purple Rain” were not my first choice, but then again I don’t listen to them, or ever intend to purchase them. That’s how I express my distaste. Not too long after I got my ghetto blaster, I started buying tapes. One of the first I bought was “No Jacket Required” by Phil Collins. He was one of my favourite singers, largely on the strength of “Against All Odds”, and “One More Night”, which was the first single from “No Jacket Required”. I had also heard some other songs from the album on LA-107, which had an album-oriented rock format. That meant it played several songs off an album, not exclusively the latest single released. One of those other songs I had heard, which eventually duplicated the success of “One More Night” by going to number one on the Billboard Hot 100, was called “Sussudio”. It was catchy, but I never quite understood what it was all about. I heard on one of the video shows Phil Collins said it was the sound his drum machine made. His drum machine came into play later. He was accused of copying Prince’s “1999” when he recorded “Sussudio”. Interestingly, at that point I had no idea what anyone was talking about because I had never heard “1999”. All the Prince any radio station played when I started listening to music was from “Purple Rain”. Collins admitted he had programmed the riff from “1999” in his machine, but said that was a common practice. The riff acted as a starting point from which to innovate and create. Once the mystique wore off “Purple Rain”, and its singles, radio stations widened the music from Prince they played. Finally, I heard “1999” and the similarity to “Sussudio” was unmistakable. Partly, I had this whole controversy in mind too, so I was not listening to it with innocent ears. Still, I liked “1999” much more than anything from “Purple Rain”. The song would again become very popular when the calendar flipped to the year 1999, as everyone sang it, especially as the new millennium approached. I finally also heard “Little Red Corvette”, which was Prince’s actual breakout hit. Again, I liked it more than anything from “Purple Rain”, or “1999”. One of the things about Prince that kind of grossed me out was his sexuality, and hypersexuality. I really did not see what others seemed to see. Worse though, to some he was a bad influence on others. One example was Sheena Easton. She had experienced success with her single “Morning Train” and the theme song from the James Bond movie “For Your Eyes Only”, and won a Grammy for best new artist. She portrayed this image of a wholesome, young Scottish lass. Then she started hanging out with Prince. She wore stronger makeup, more miniskirts, and was more provocative on stage and in interviews. One interviewer said she went from being the girl next door to the girl at the end of the block. Her next album was sassier, with the single “Strut”. That was followed up by “Sugar Walls”, which talked about “…slipping inside my sugar walls…” It was quite provocative – and written by Prince. Again, they ran afoul of unofficial censor Tipper Gore. “Sugar Walls” was on the same list as “Darling Nikki”. The follow-up album to “Purple Rain” was “Around the World in a Day”. Like a lot of albums that follow legendary albums, it did not have the same level of success, but its singles still populated the airwaves for a year. By the time it was released in 1985, I was listening to the radio a lot while I played Intellivision. Again, I started to hear a song on LA-107 that sounded suspiciously like Prince. It was called “Pop Life”, and it was kind of catchy. It peaked at seven on Billboard. Oddly, it was released in Canada first, but was the third single released in the U.S.
What followed was the first Prince song I genuinely liked. It was called “Raspberry Beret” and it was just a catchy song. It would rocket all the way to number two on Billboard. “Around the World in a Day” went all the way to number one on the Billboard album chart, where it stayed for one week. It also produced the first single I really liked by Prince, but it would not be the last. Prince was back on the silver screen in 1986 with “Under the Cherry Moon”. I heard about the movie long before “Parade”, the album to accompany the movie, was in stores. That was courtesy of advanced promotion, most notably updates and interviews on “Entertainment Tonight”. All I really recall about “Under the Cherry Moon” is the use of black and white. I also joked that red would displace purple in Prince’s stylings. Then pretty soon, I heard this song on the radio that caught my ear. It was different. Soon, I discovered it was “Kiss’ by Prince. It eventually went all the way to number one on Billboard. It was a strange feeling, but I was beginning to like Prince. I was not the only one. My best friend Chris Vining was getting into him as well – but we were reluctant listeners. One Friday night, we were cruising down Mayor Magrath Drive in Lethbridge in our friend Dave’s truck. He was playing a mixed tape he made, and "Kiss" came on. We always used to turn around at the Woolco, which was at the extreme south end of the strip. Well, standing there were three really good looking girls we liked. We waved as we passed them. Then Vining broke the news. We all cringed, even just a little bit. While “Kiss” was moving up the charts, a new band had also made its debut. They called themselves The Bangles, and had a single that caught on very quickly. It was called “Manic Monday” and went all the way to number two on Billboard. It was written by a songwriter with the mysterious name of “Christopher”. Prince was back again in 1987, continuing his prolific run in the decade, with the album “Sign ‘O the Times“. The first single was the title track, which really didn’t do anything for me, although it did go all the way to number three. The next single that caught my eye was “U Got the Look”, which was another duet with Sheena Easton. Her transformation to a sexier, more suggestive performer continued. It was a good song, I thought, and went all the way to number two. The last time I ran into Prince’s work was at the tail end of the decade. The year 1989 seemed so far removed from 1987 because I was going into my third year of university and it seemed so long since high school and “Sign ‘O the Times”. For more than a year, anytime I went to a movie, I would see this mysterious trailer. It was dark, and had this dark plane fly around. The screen would go black and then, slowly appearing, was the Batman logo. It would be the most hyped movie in years. There, doing the soundtrack, which was not as prominent as “Purple Rain” or “Under the Cherry Moon”, was Prince. The album went to number one, as did the single “Batdance”. It was the last time I ever listened to a new release by him. Prince also gave a start to other artists in the 1980s, most notably women. One was Sheila E. She worked on “Purple Rain” and some of his other albums. She would also release a couple notable songs of the decade – “The Glamourous Life” which went to number seven on the Billboard Hot 100 and for which she was nominated for two Grammys, and “A Love Bizarre”, a duet with Prince, which went to number 11 on the Hot 100. Sheila E and Prince even had a brief romantic relationship for a short time. Another one was Apollonia, or Apollonia Kotero. She played the female lead in “Purple Rain” and actually recorded her own version of “Manic Monday” in 1984, before The Bangles came along. She left Prince’s world to play the character “Apollonia” in my favourite Friday night soap opera, “Falcon Crest”. She played a girlfriend to Lance Cumson, played by Lorenzo Lamas. A third was Vanity, who was Canadian singer and actor Denise Katrina Matthews. She met Prince at the 1980 American Music Awards where he named her “Vanity”. He also made her the lead singer of the girl group Vanity 6. She would resign that role in 1984, so her role as the lead in “Purple Rain” was taken over by Apollonia. Vanity would experience some acting success in “The Last Dragon” then her most prominent role as the female lead in “Action Jackson” opposite Carl Weathers. It always seemed Prince had beautiful women around him. During the 1990s, I never saw nor heard Prince, except when there were jokes about him. He had a falling out with his record company, and changed his name to a symbol, he described as a combination of male and female. He became known for years as the artist formerly known as Prince. Someone joked at the end of that first year he did that, that in the new year he would change his name to a sound only dogs could hear. Tributes have been pouring in for Prince. The accolades have been overwhelming – trailbreaker, innovator, artist. It is all true. He really was one of a kind who put his own signature on rock music. For me, he was not one of my favourites, or someone whose records or tapes I would buy. But his music, especially “Let’s Go Crazy”, “When Doves Cry”, “Raspberry Beret”, “Kiss” and less so “Little Red Corvette” and “1999”, was part of the soundtrack of the 1980s. It was part of growing up. Any time I flipped on the radio, there was a good chance a Prince song would be playing or coming up. He was talented and prolific. He was one of a kind for sure. Initially, I really didn’t find his music that appealing, but eventually it grew on me. I’ll never forget Prince – or the colour purple. Prince was born in Minnesota, lived in Minnesota, Paisley Park Studio is in Minnesota. The Vikings football team colour is purple, had a defensive line in the 60's and 70's that were known as the Purple People Eaters. Prince's 'colour' was purple and I have often wondered, was this a coincidence?